Yoshi Falls is an offroad rally track placed in the middle of the jungle. 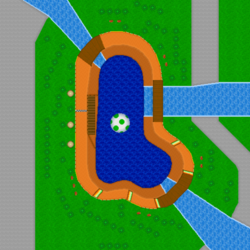 Yoshi Falls may have received inspiration from DK Mountain, a track on Mario Kart: Double Dash!! for the GameCube. This track may be a little tricky for novices, as that waterfalls tempt you to pass through them when they really throw you off, and that power boosts can be done only in certain places while you can snake in only one. 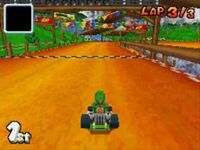 However, keeping steady on the track and far from other opponents trying to knock you off the track will evade many of the annoyances and burdens on Yoshi Falls. The main hazard is the huge cliff on the inside of the track. Drop down here and you'll have to be fished out by Lakitu, costing you at least 5 seconds. The only other real hazard is the second waterfall. Don't try to go through without some sort of speed boost. Because of the huge drop on the inside of the track, it's not really possible to cut corners here. Although, there are a couple of different paths to choose from. See Tips section below for details. When passing through the first waterfall, try to prepare a miniboost and release it once you've gone through it. Don't forget to pick up an item from an item box! A large waterfall exists after the first waterfall. It's to the right of a bridge used to detour that waterfall. Going on it without a mushroom will either 1} make you fall off or 2} slow you down. If you have one mushroom handy, you can pass through the waterfall efficiently by releasing your mushroom upon entering it. Keep far from the edge of the waterfall, otherwise you might get pushed off the edge! The third waterfall carries Item Boxes downstream, so go through it if you need an item to use. Stay off of it if you are going too slow. Skip the final zipper before the finish line and powerboost through the corner to save time. This page was last edited on 6 June 2015, at 23:54.